This is the 3rd week with no yardsales. Of course, the first two weeks were due to Hurricane Gustav riping through our community. And this week due to Hurricane Ike; we are on the outskirts but getting mild winds and low areas are flooding around the lake, streams & bayous. As I was heading for yardsale withdrawals, Beau and I stopped by the Restore. 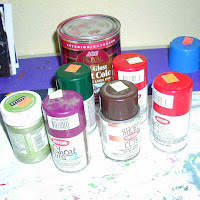 And, all is not lost, was able to pickup 5 cans of spray paint, an almost quart of red paint and some green metallic faux something or rather. This should hold me over till next week.